For some people, the weeks between Thanksgiving and New Year's Day are more than enough time to celebrate the holidays. But the people living near these locations may feel differently. From Alaska to Tennessee, here are seven towns where Yule is a 365-day affair. You wouldn’t be faulted for mistaking this 2200-person town for Santa’s home-base. While it’s closer to Fairbanks, Alaska than the true North Pole, it does feature several festive landmarks such as Santa Claus Lane, Kris Kringle Drive, and an expansive Santa Claus house that’s open year-round. In 2015 residents even elected a local man named Santa Claus to preside over the town as mayor. Settled in 1944, North Pole has a development company to thank for its quirky address. The hope was that a toy company would be enticed to move there so they could market their toys as being “made in the North Pole.” That never came to fruition, but the town has embraced their jolly title nonetheless. Things get especially exciting around December, when they celebrate with an ice sculpture contest and an annual winter festival. It’s also the time of year when the town receives hundreds of thousands of letters addressed to “Santa Claus, North Pole, Alaska.” A team of volunteers works each season to ensure every letter is answered. There’s no need to journey north of the Arctic Circle to learn what it takes to be Kris Kringle. The most prestigious Santa Claus academy on earth can be found in Midland, Michigan. Since 1934, the Charles W. Howard Santa Claus School has been attracting rotund, rosy-cheeked gentlemen to the Midwestern town. It’s there that they’re taught reindeer handling 101, how to dress like St. Nick, and the history of the legendary character. Once the holiday season rolls around, the newly trained Santas disperse to malls across the country—or if they decide to stick around, they can march in Midland’s annual Santa Parade. Located off U.S. Route 30, Paradise is home to one of those charming roadside museums that can be found in so many small towns across America. What sets this attraction apart is its yearlong commitment to celebrating a single day in December. The National Christmas Center comprises 20,000 square feet of exhibits tracing centuries of holiday history—visitors can peek inside a recreation of an F. W. Woolworth's 5 & 10 Cent Store, browse through over 500 depictions of Santa Claus, and learn about Christmas traditions around the world. On their way out, guests can do some early holiday shopping at the museum’s gift shop no matter what month it is. The streets of Frankenmuth feel like they belong on the pages of a storybook. Dubbed “Michigan’s Little Bavaria,” the town is home to covered bridges, charming old-world architecture, and horse-drawn carriages reminiscent of another era. But the town’s main attraction is what's said to be the world’s largest Christmas store, Bronner’s Christmas Wonderland. The 320,000-square-foot space contains 350 decorated trees, 150 styles of nutcrackers, and gifts imported from 70 countries around the world. A hundred thousand Christmas lights brighten the store’s exterior throughout the seasons (their electric bill averages $1250 a day). 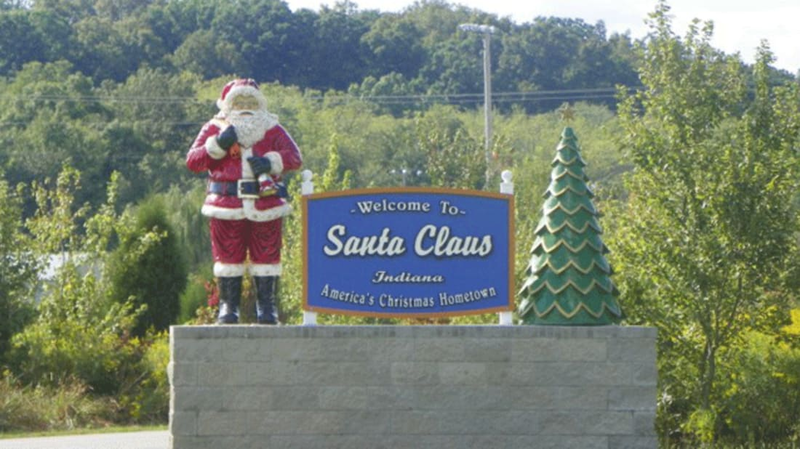 The residents of Santa Claus, Indiana didn’t have visions of sugar plums dancing in their heads when they came up with the town’s merry moniker—they were just suffering from a lack of inspiration. In 1856, back when the town went by Santa Fe, they learned that a town of that name already existed in Indiana. Wanting to at least keep the first half of their address, they reportedly chose the name Santa Claus simply because they failed to come up with something more creative. More than 150 years later, Santa Claus, Indiana is the state’s number one destination for year-round holiday festivities. Visitors can check out the town’s Holiday World (which pays homage to Thanksgiving, Halloween, and Independence Day as well as Christmas), pick out sweet treats from Santa’s Candy Castle, or head over to Santa’s Lodge motel and bask in the glory of the two 12-foot fiberglass St. Nicks on display outside. Kids looking to reach the community’s famous post office can mail their holiday wish lists to 45 North Kringle Place, Santa Claus, IN 47579. Finding Bethlehem, Pennsylvania isn’t difficult for those nearby—just follow the electric star that looks down on the town from its perch on South Mountain. The festive landmark was first erected in 1937 in an effort to attract tourists to the town in the midst of the Great Depression. That same year, Bethlehem was officially named “Christmas City, U.S.A.” by the Chamber of Commerce—a fitting title for a town that was founded on Christmas Eve in 1741. Originally made from incandescent bulbs strung on plywood, the star of Bethlehem currently consists of steel and LED lights that glow every night of the year. Looking for a blinged-out nutcracker in the middle of July? The Incredible Christmas Place in Pigeon Forge, Tennessee has you covered. The self-proclaimed largest Christmas shopping village in the South is home to wreaths, lights, ornaments, and any other holiday-themed decor you may need whatever time of year you need it. In 2007, the store opened a festive hotel across the street where customers could continue keeping with the holiday spirit even after they’d finished shopping. The Inn at Christmas Place features performances by a singing Santa twice a week, present-wrapping workshops, and plenty of holly jolly embellishments. Things get even more intense around the actual holidays, with 30 or more trees displaying nearly half a million lights on the hotel grounds.